21 year old female with scalp lesion. 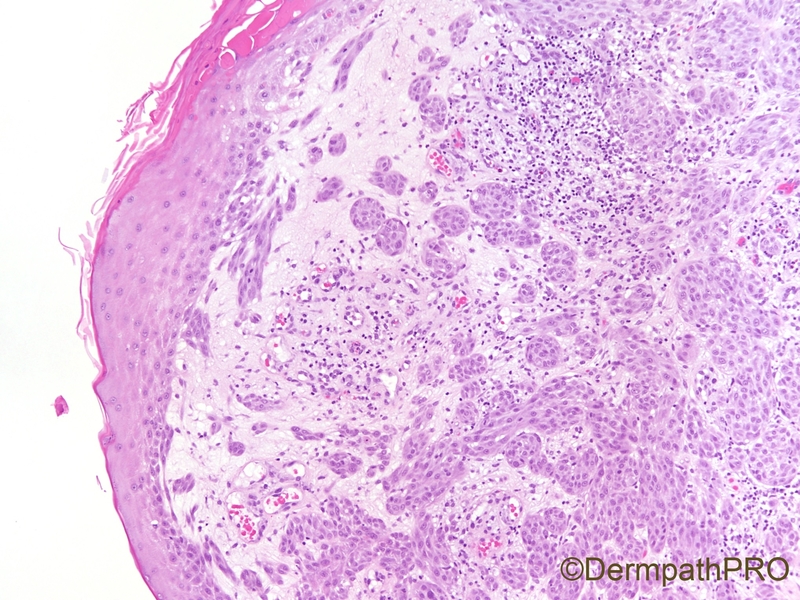 Lymphoepithelioma like carcinoma v/s inflamed SCC. 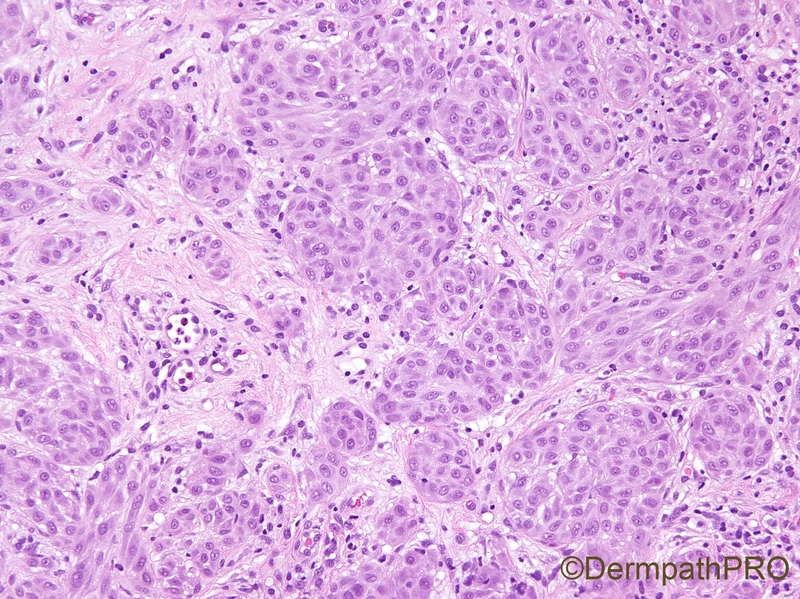 Metastasis of LELC from other sites is also a possibility. Young patient. Difficult lesion (at lest for me). 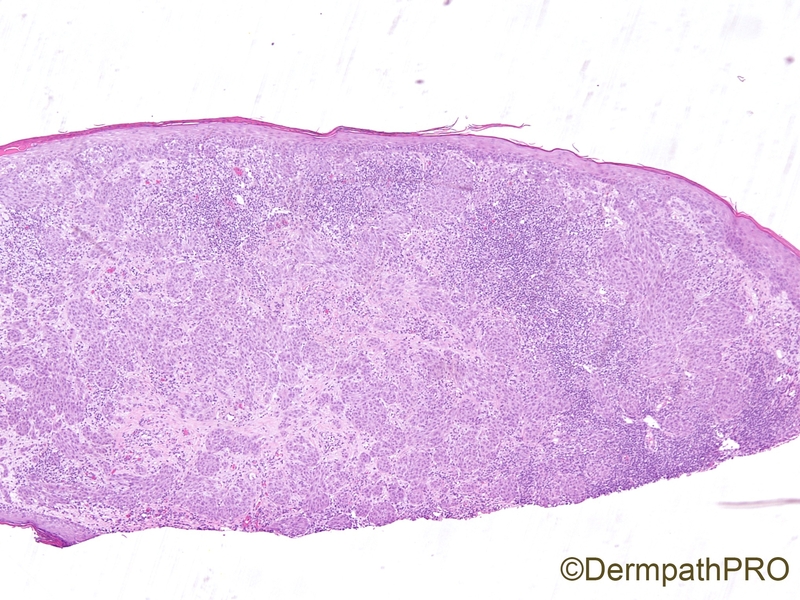 It seems epithelial whit connection to Epidermis and some vacuoles in the citoplasm. Favor SCC. I wonder if the patient have some underlying genetic alterations. 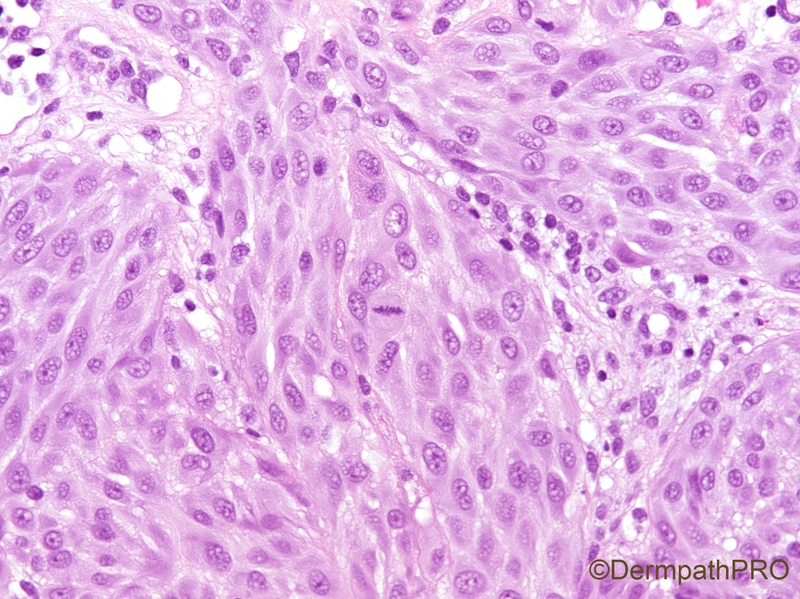 Spitz Nevus ( oriented fascicular pattern and vesicular monomorphic nuclei ). Don't really appreciate an epidermal component. So would do S-100 protein to make sure it is indeed a melanocytic lesion. 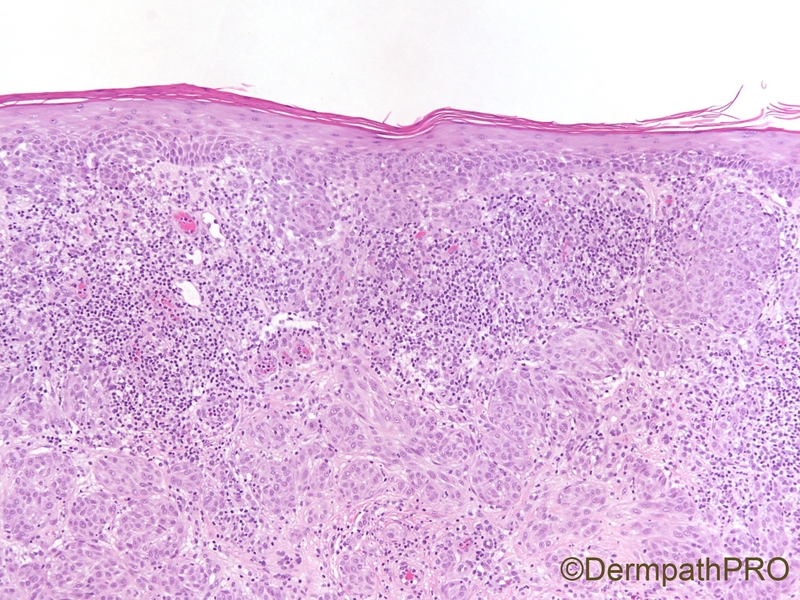 Neurothekeoma sometimes can be mistaken for a melanocytic lesion. I would be very careful with this lesion. As Vincenzo suggested this looks like a spitzoid lesion not overtly malignant, would suggest complete excision and express the uncertainty on the report. Maybe some ancillary techniques could be useful. After read your comments I think you all right. Melanocityc lesion it would fit more. Cellular Neurothekeoma it's a great differential. Love your comments. These are always challenging cases. This was S100 and Melan A positive, and cytokeratin negative. We opted for a Spitzoid lesion with atypical features and recommended re excision. Long term outcome is uncertain and the patient will be watched closely. 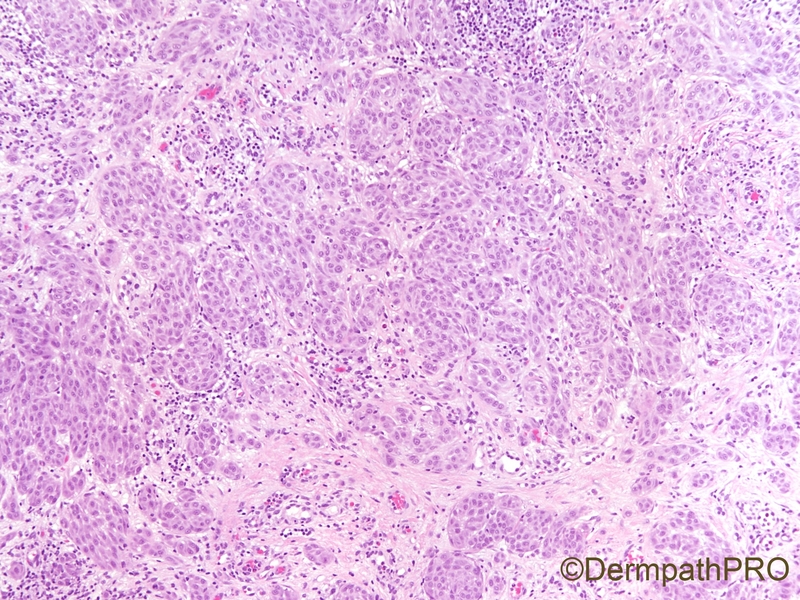 Agree with atypical Spitz tumour, uncertain for malignancy. Complete excision with clear margins is recommended (5mm). We'd usually run Ki67, HMB45, MelanA & p16 for STUMP/MELTUMPs.